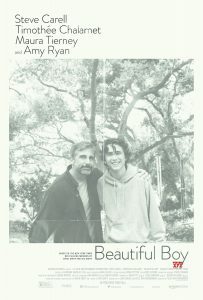 Based on the memoirs of David and Nic Sheff, Beautiful Boy portrays a family’s ordeal with drug addiction with grace. Not to be confused with the 2010 film of the same name which focused on the parents of a mass shooter, the title does similarly refer to a well-loved child who hit rock bottom despite support. Timothée Chalamet is a wonder to behold as eighteen-year-old Nic Sheff, a charming kid who falls into the traps of crystal meth. He pulls himself out of the many holes he creates for himself, usually with the help of his father, David (Steve Carell), and he’s far from the image many of us hold of the typical addict. It’s perhaps more palatable to some who may be quick to write off drug addicts as nothing but a scummy stain on society, and will hopefully make them question those assumptions. Steve Carell, once again proving he does drama as well as he does comedy, plays David Sheff, one of the most loving and supportive fathers you’re likely to see portrayed on screen. That he would produce anything other than a completely well-adjusted son is surprising, but the film shows that drug addiction is far-reaching across both the socio-economic spectrum and regardless of support levels. Along with David, we see the toll Nic’s addiction places on his step-mother (Maura Tierney), and his two younger step-siblings (Christian Convery and Oakley Bull), and later in the film, his mother (Amy Ryan). The film involves various flashbacks to Nic’s childhood where we see the bond between him and David, and there’s certainly no suggestion that his parents’ marriage breakdown is the cause of his addiction. All child actors are wonderful, including the brilliant Jack Dylan Grazer (It). We see nothing but a beautiful relationship between father and son, and feel the pangs of heartbreak that a father who has always shared such a bond must feel when it all goes to hell. Director Felix Van Groeningen and editor Nico Leunen intersperse these scenes well. Luke Davies (Candy) co-wrote the screenplay with Van Groeningen, and his own experience with drug addiction results in a script which feels genuine and honest. This is a film that is never saccharine, nor one that sensationalises addiction, and yet it will most likely break your heart in two. A sense of despair sits over the film, with the only sign of hope coming when Nic has really hit rock bottom. Here it feels that sometimes that’s the only way back, but in many cases others would not be so lucky. That sense of despair increases even more when you consider that Nic’s recovery probably has much better odds than most, given his supports and his family’s wealth. In one scene his parents decide against one rehab facility because $40,000 a month is just a bit too much, which makes you wonder, what hope in hell does your average Joe have in overcoming addiction without those kind of funds available? It’s mentioned in the closing titles that addiction resources are sorely underfunded and it’s easy to imagine that it’s not the first cause do-gooders will be willing to put money towards. But maybe this film will prove an eye-opener to some. While some viewers might watch Candy with a “this would never happen in my circle” mentality, Beautiful Boy shows that in fact it can happen to anyone, and there’s not always an obvious reason why. Beautiful Boy is lifted by an astounding lead performance by Timothée Chalamet, no doubt one of the most exceptional performers of his generation. He deserves, at the age of just 23, to get his second Oscar nomination. As for the film, this Oscar season will probably produce the usual mix of grit, spectacle, and dramatic displays of emotion. Beautiful Boy sits as a rare gem amongst the big guys; despite its subject matter it’s calm and measured, while still affecting. This review was first published on 22nd October 2018 at Film Blerg.